LOVE BEING A NONNY! : Happy 35 Years! I was 18. He was 21. Wow. Just wow. He is still the one my heart longs for. Thank you for being better to me than I am to you. Thank you for your kindness to me. For telling me you adore me. I was a 19-year old bride, so I can relate to that wonderful youthfulness. You two are a good lookin' couple; congrats on 35 years. I know you can hardly believe all that time that has passed. I think you're good for at least 35 more! Happy Anniversary! I wish you many, many more wonderful years together! Wow is right. You are still just as beautiful today as you were 35 years ago. Together we did produce some fine looking offspring. I love you and I am looking forward to 35 more years. You are the zig to my zag. Happy...Happy...Happy Anniversary! I was an 18 year old bride...and in love more today.....after 23 years than I was then. What a great example.....you are! Beautiful words...beautiful marriage. May God continue to bless your time together! What a testimony! Happy Anniversary and may God bless you with many more years together. You guys are such a precious couple and I can tell you love each other so much....and I only know you in blogland! I love seeing couples like you!! Awww, Happy, Happy Anniversary. Hope it was a great day for both of you. Happy Anniversary! We were 18 and 21 also. We are two years ahead of you at 37 years. I can't imagine letting one of my daughters get married that young. Times were so different then, but I wouldn't change any part of it for myself. Have a wonderful day together. Congratulations! I was a 19 year old bride! Don't the years fly by? We celebrated #36 this year! Gosh, what a wonderful photo! You look so sweet...and soooo young. Loved your picture, Angela! You both look so young!!! I got married when I was 22. We have been married 34 years, so we are right behind you. Hope you had a wonderful anniversary. Love & blessings from NC! 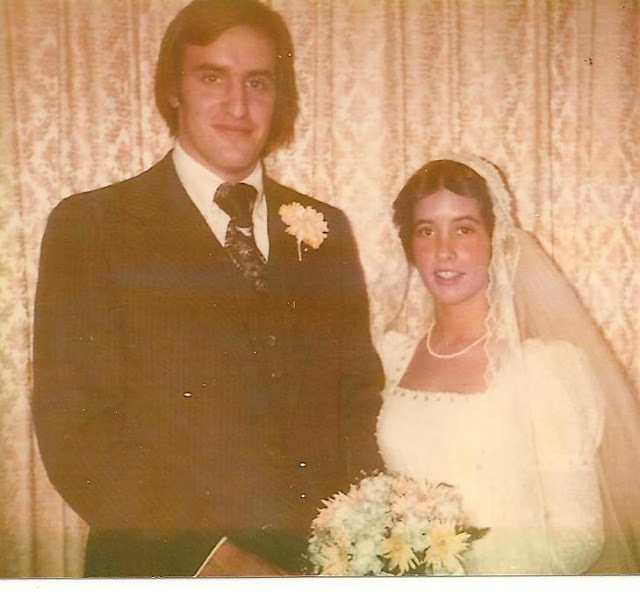 Happy 35th Anniversary Angela and Mike. Have a blessed year - enjoying the Lord, each other and your beautiful family. I was 18 and Harvey was 21 when we got married back in 1956. Happy, Happy Anniversary to the sweet couple!!! Happy Anniversary! I admire anyone who has such a long and loving marriage. I'd love to see the entire photo! I just found your blog and have fallen in LOVE with your Grandaughters...my goodness!, could they be more beautiful! Enjoyed surfing through your space this morning and getting to know you a bit. Being a Nonny is such a gift isn't it? My love and I have 10...we are blessed beyond. Have a wonderful weekend, nice to meet you. Stop over when time allows...love to have you too! I love this and you are such an inspiration to me in so many ways. I think about you often and how awesome it would be if you lived close by and we could just meet for coffee every week and I could get my NONNY cup filled!